REGION — Nuclear waste storage facilities at the decommissioning San Onofre Nuclear Generating Station are “fatally flawed” and could cost Southern California nearly $13.4 trillion over a 50-year period if a major release of radiation occurs, according to two reports recently published by the Samuel Lawrence Foundation. 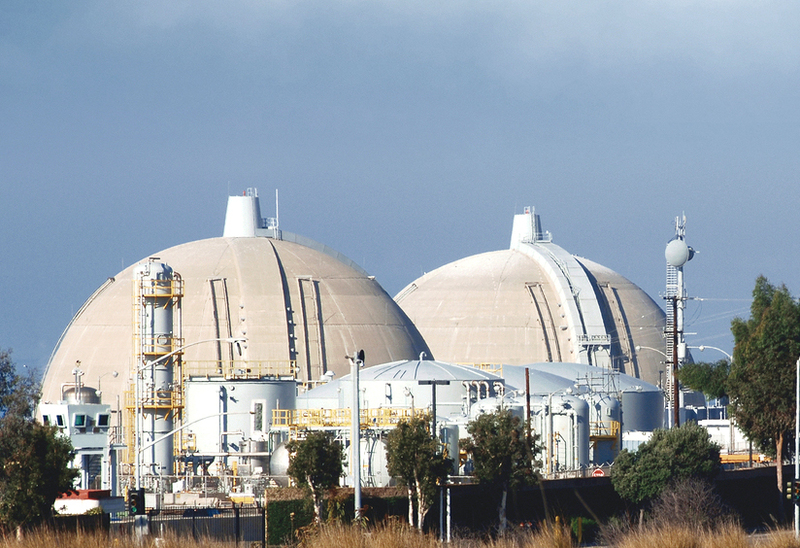 The reports were published during an ongoing Nuclear Regulatory Commission investigation into electric supply company Southern California Edison and its contractor, Holtec International, which designed and built the storage facility. The investigation stems from an incident on Aug. 3, 2018, when a full canister of spent nuclear fuel came within a quarter-inch of falling 18 feet. Edison’s plan is to move 73 canisters into the oceanfront storage vault, having already moved 29 by the reports’ publication. After the August incident, regulators stopped any more canisters from being loaded into the vault, built to hold 3.6 million pounds of nuclear waste at the San Onofre site, located on Marine Corps Base Camp Pendleton on the coastal side of I-5. 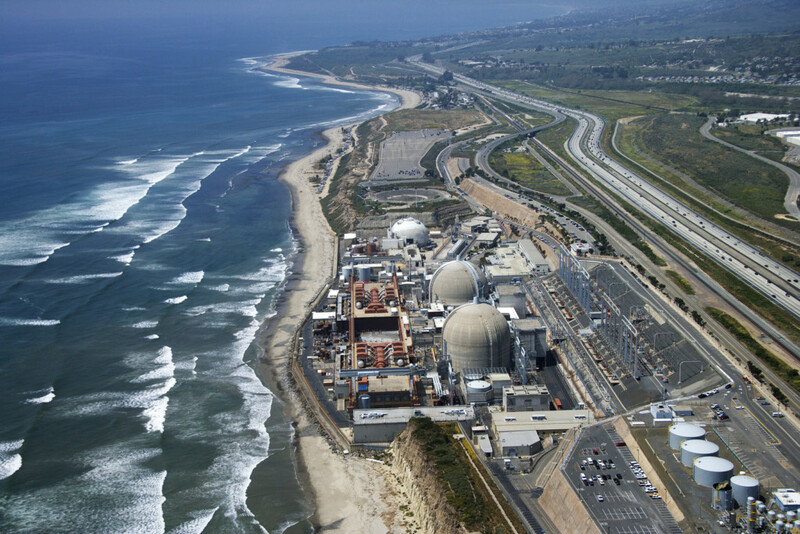 The San Onofre Nuclear Generating Station (SONGS) began operating in 1968 and closed in 2012 after continuous leaks were discovered in the plant’s steam generator tubes. The first report, titled “San Onofre Nuclear Waste Problems,” examines damage caused to the “thin-walled, steel” canisters as they are lowered into the dry storage vaults. The report refers to this damage as “gouging” and considers it the most serious of the issues facing the storage facility. The report notes how storage tanks at gas stations in California must be double-walled after experiencing how single-walled containers can leak gasoline into groundwater. At an Aug. 9, 2018, community engagement panel discussing the decommissioning of San Onofre, Occupational Safety and Health Administration inspector David Fritch told attendees about a near-accident at the storage facility. When workers using a crane were moving a canister containing spent nuclear fuel, it became lodged at the top of the cavity enclosure container into which it was being stored. Investigations revealed the operators and managers could not see the canister as it was being lowered and became stuck for nearly an hour, hanging 18 feet in the air from the guide ring along the top of the container. 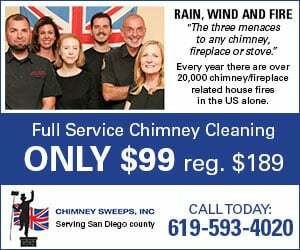 The Del Mar-based nonprofit Samuel Lawrence Foundation’s research determined that had the canister fallen, it could have hit the steel-lined concrete floor of the facility with “explosive energy greater than that of several large sticks of dynamite.” The damage could have caused a large radiation release, according to the report, and could have ruined the facility’s cooling system. According to the report, each nuclear storage canister contains 37 spent fuel assemblies, which generate “enormous amounts of heat” and are cooled by an air duct system, which could have been blocked by the damage from a canister falling. If that had happened, great quantities of water would be needed to cool the reaction and prevent or control a meltdown. That water would instantly become radioactive steam, similar to wh­­at happened during the 2011 Fukushima Daiichi nuclear disaster in Japan. In the report, retired U.S. Navy Rear Adm. Len Hering, Sr., who previously served as a nuclear weapons safety officer­­­­, provided a scathing assessment of the storage facility’s management practices. The report also addresses the risk of storing them so close to the Pacific Ocean, where rising sea levels, frequent high humidity and coastal fog make metal susceptible to short-term corrosion and stress-induced corrosion cracking. According to the report, the mean high tide level is about 18 inches below the base of the oceanfront storage facility, which means sea level frequently exceeds that height. It states it’s likely that the present groundwater table will leach into the vault and result in damp storage, which the vault is not designed for. Rising sea levels due to climate change could make things worse, potentially causing the bottom seven feet of the storage canisters to be submerged and possibility create a similar crisis to Fukushima, where spent fuel was exposed to moisture. In the second report, titled “Potential Economic Consequences from an Event at the San Onofre Nuclear Generation Station Interim Spent Fuel Storage Installation,” uses economic impact modeling software to estimate economic losses from diminished activities within evacuation zones of one, 10 or 50 miles over one year to 50 years. In a scenario looking at contamination across a one-mile radius, the report states the most significant loss is likely the disruption of regional transportation for up to a year costing $266 million. The 1-mile radius, which would only represent a minor event, would still affect I-5 and the rail line. Looking at evacuation zones of 10 to 50 miles over a one- to 50-year period, residential property losses could amount to $11 billion to $500 billion depending on the evacuation scenario. In the 50-mile impact scenario, about $13.4 trillion in gross regional product could be at risk over a 50-year period. The first report concludes that the nuclear waste at San Onofre requires “much better storage configuration” and needs to be moved to a “technically defensible storage facility” further away from major transportation corridors like I-5. “If an accident, natural disaster, negligence, or an act of terrorism were to cause a large-scale release of radiation, the health and safety of 8.4 million people within a 50-mile radius would be put at risk,” the report states. It also demands that a “complete analysis of canister loading procedure and comprehensive risk assessment” be conducted transparently by an independent party, and recommends a permanent stop to the loading of nuclear storage canisters into the seaside vault, to begin placing spent fuel into “reliable canisters that can be monitored, inspected and repaired” and to move them to a facility at a much higher elevation. How does edison continually get away with this??? The biggest risk is people with very shallow understand of radiation being in decision-making positions, and being influenced by media fear mongering. So where have the state and federal regulatory agencies that are paid to serve and protect the public? Why have the California Coastal Commission and the Public Utilities Commission not taken strong stances with regard to ending this flawed operation? And where is our nation’s Nuclear Regulatory Commission, allowing HOLTEC to redesign canisters, as they go, without oversight, increasing risk potential without accountability, while burying such hot toxic waste near our beautiful California coast? And exactly why do our taxes funnel to a Homeland Security Agency if not to protect our Homeland from such explicit errorism with a high probability for environmental and economic tragedy? If private corporation,PG&E, can bail on their responsibility to the public for the annihilation by crying Bankruptcy, it is not hard to imagine HOLTEC and SC Edison racing to a file a bailout first. How far does a radioactive nickel on the dollar go folks? And where have the state agencies, the California Coastal Commission and the Regional Water Quality Commission been while SC Edison and HOLTEC have been assuring the public, redesigning as they go, that there is no worry? Have they signed off forever on this SC Edison and HOLTEC operation regardless of how it operates, or doesn’t? With PG&E filing for bankruptcy to the north, leaving countless families and businesses holding their bags of ashes, it is not hard to imagine the race for first to file between SD Edison and HOLTEC, not if there is canister and cooling failure, but when. How do we begin to pay for unimaginable environmental and economic tragedy to our Southern California groundwater, our air, our beaches, and our sea after the ruling is made that a mere radioactive nickel will be required to pay for each dollar sought? It is a bitter irony that this hot, toxic burial occurs at Camp Pendleton, a Marine Corps Base, where troops train for our Homeland Security. I cannot imagine a greater threat to our homes, our schools, our troops, businesses…for a very long time. Thank you Coast News Group, writer Samantha Taylor, and The Samuel Lawrence Foundation for keeping the brighter light on this for us all. Only the uneducated fear Nuclear power; it is clean and safe… get over it! Personally I do not “fear Nuclear power”, however, we are not discussing “the power” aspect, we are talking about waste product. A very close friend of mine assisted in seismic research after Bechtel had already started building San Onofre. When the major fault line running directly underneath was discovered, Bechtel had any mention of it shut down. I have worked in the radiological and environmental business on the east coast for years. My advice, listen to U.S. Navy Rear Adm. Len Hering, Sr.. Follow his advice in addition to contacting your representatives and demand they move the waster to a higher, dryer location. I love nuclear power, done right. We wouldn’t have a Navy without it. 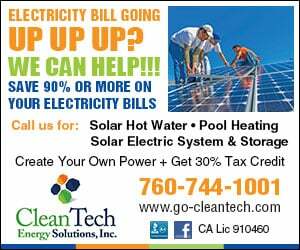 It used to provide 20 percent of California’s electric energy, free of carbon and other emissions. Shutting down SONGS prematurely was a huge blunder that reeks of mismanagement, and putting the spent fuel on the beach near saline groundwater in a tsunami and earthquake zone and population center, in thin-walled containers that do not live up to world class standards, compounds the issue greatly. If anyone doubts the power of groundwater against a concrete vault, study the story of “Miss Belvedere” of Oklahoma City. A 1957 Plymouth story scarier than “Christine,” because this one is real. The U.S. has to stop shutting down its nuclear plants — solar and wind have merely replaced about 75 percent of the nuclear we have lost over the past decade or so. This is not even breaking even. Not to worry. In our neoliberal capitalist paradise even a complete nuclear catastrophe simply becomes another opportunity for profit and for adding to the GDP – what could possibly go wrong in leaving nature and a habitable planet out of our “economic calculations” where they are considered “externalities?” What indeed? This is one plant out of how many in the U.S. and around the world that are near oceans, lakes, and rivers. The complete idiocy at play here by all of humanity is quite stunning. It would appear we don’t even need to wait for rising seas for this facility to become a serious danger as it obviously already is. Both the 51 aging Areva HUHOMS thin-wall canisters and the new Holtec thin-wall canisters (both only 5/8″ thick) must be replaced with proven thick-wall cask technology used in most of the world. At Fukushima, their 10″ thick Areva casks survived the great earthquake and tsunami. In Germany, their thick-wall casks are up to 19.75″ thick. The thick-wall metal cask designs can be inspected inside and out, repaired, maintained and monitored in a manner to prevent radioactive leaks and explosions. The thin-wall canisters meet none of these common sense safety requirements that we expect even in the cheapest car. These containers are pressure vessels yet the NRC gives the thin canisters safety exemptions to basic ASME manufacturing standards. They don’t even have pressure monitors or pressure relief valves to prevent these thin cans from exploding. Even a pressure cooker has that. The NRC is another captured government agency. Our elected officials are trusting the wrong “experts”. The Governor of California controls the Coastal Commission and Public Utilities Commission. He can stop giving ratepayer money to Edison for this. He can revoke state San Onofre Coastal Development permits and other permits. He can take a leadership role along with his Aunt, House leader Nancy Pelosi, and Senator Kamala Harris, and our local state and federal elected representatives (such as Mike Levin) and demand all nuclear waste be maintainable, monitored and retrievable in containers that have an ASME N3 stamp and are designed to be transportable. Governor Brown failed us. Issa failed us. See more information and petition at SanOnofreSafety.org Each canister holds roughly a 1986 Chernobyl nuclear disaster and we’re running out of time to take action. The Coast News did not reach out to Southern California Edison or, apparently, the Nuclear Regulatory Commission before posting this article. Good write up! This is truly unacceptable and insane. Thanks for sharing more than most media sources. This suppressed and critical issue needs ongoing headline attention until it is out of the hands of greedy corporations hands that are much more invested in shareholder profit than protection of this precious land. There is far more to this story and local activist are needed to help share the truth and instill public pressure on elected officials. So, how many have died or become ill from radiation from this and other nuclear facilities? What are their names, please? Do nuclear workers have shorter lives or are plagued by disease? Or is this just fear mongering, damaging one of the best technologies for power generation invented by man? At a time when we really need it? ”13.4 trillion”? How about a reality check.